them at Kringen. 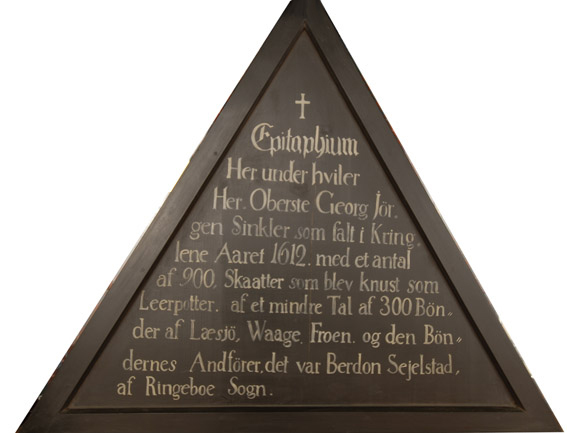 They did not know that young men conscripted from the valley had been massacred in the Kalmar conflict, and that the farmers from Gudbrandsdalen were determined to resist them. Plans had been laid for an ambush, and the ambush was to be triggered by local girl, Guri, who was to watch the column as it made its slow passage along the old King’s road. To further distract the Scots from the ambush preparations, tradition adds that a man rode sitting backwards on his horse. Once the right moment arrived, Guri, watching from the mountain top above Otta blew a blast on her lur, a long wooden horn, or perhaps a buckhorn, traditional to the area. 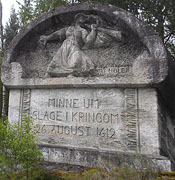 Local tales have it that the ambush started with logs and rocks crashing down on the Scots from the steep mountainside and blocking the road preventing advance or withdrawal, and Norwegian folklore records that George Sinclair was felled with a silver bullet from a single musket shot fired by Berdon Sejelstad. 450 farmers fell on the Scots with their axes and scythes and fierce hand-to-hand conflict ensued that left the river running red with blood. 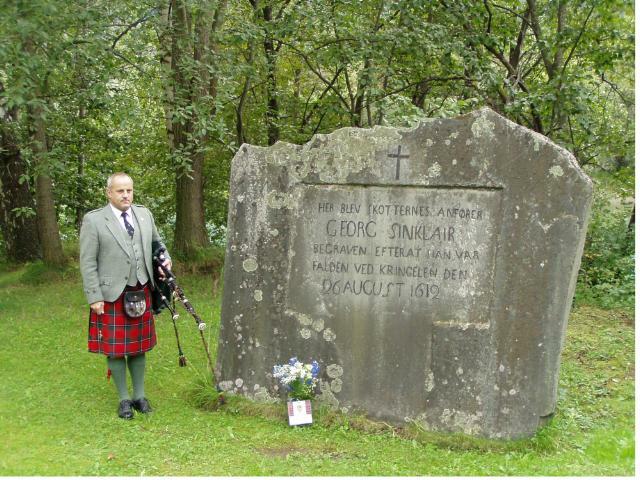 of 900 Scots who were crushed like clay pots by the smaller number of 300 farmers from Læsjö, Waage, Froen. The farmers' leader was Berdon Sejelstad from Ringeboe, Sogn"
After one and a half hours, only 134 Scots remained alive though it is thought some escaped. The farmers lost 6 men. 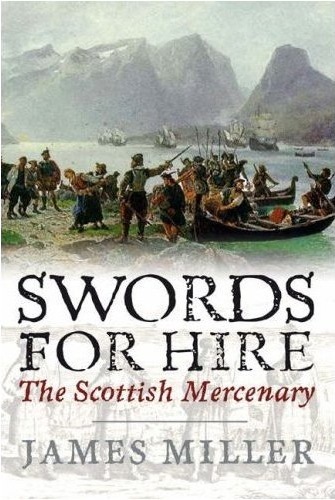 It is thought that the Scots had only a few weapons between them, expecting to be armed when they reached Sweden. 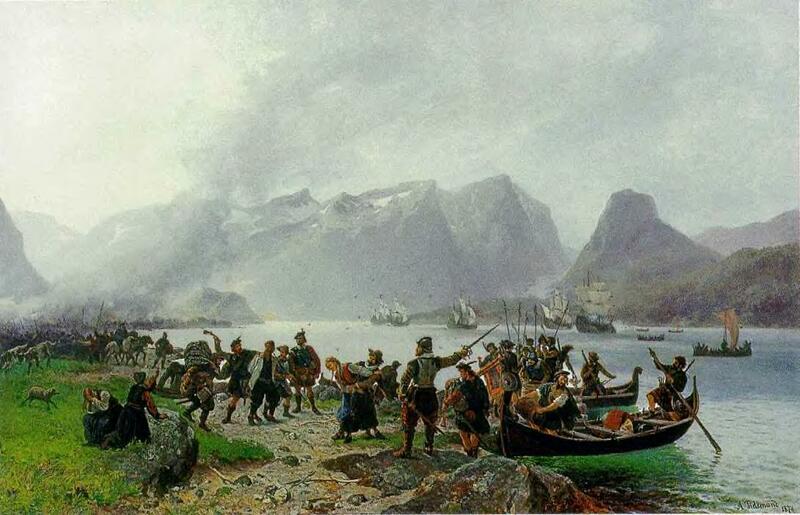 The survivors were taken prisoner and led off to Kvam, and were to be taken to the Akershus Fortress in Oslo to await their fate, but the farmers had their harvest to think of, and again, tradition has it, they began to execute the prisoners. Certainly only 18, were taken to Oslo and forced into Danish-Norwegian service. Four of the officers, Alexander Ramsay , James Scott, unofficially recruited in Scotland 4, Captain Henry Bruce 5 and Lieutenant James Monneypenny 6, a translator, previously in Danish-Norwegian service, were sent to Copenhagen where they were taken in by the British Ambassador to the court of Christian IV, Sir Robert Anstruther 7, who returned them home after a summary interrogation. 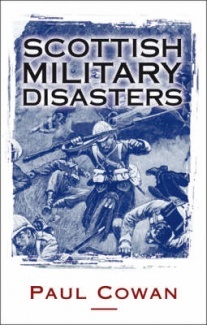 Captain Hay is not listed among the surviving officers and is thought to have been killed at Kringen. Ensign John Bowie 8 was released on 31st December 1612. There were certainly many survivors, and there is tradition of the local “Skotte” (Scots) farms being cleared by one such survivor. We have recently learned of a survivor who escaped from the Akershus Fortress and made his way to Sweden, where his descendants still live. 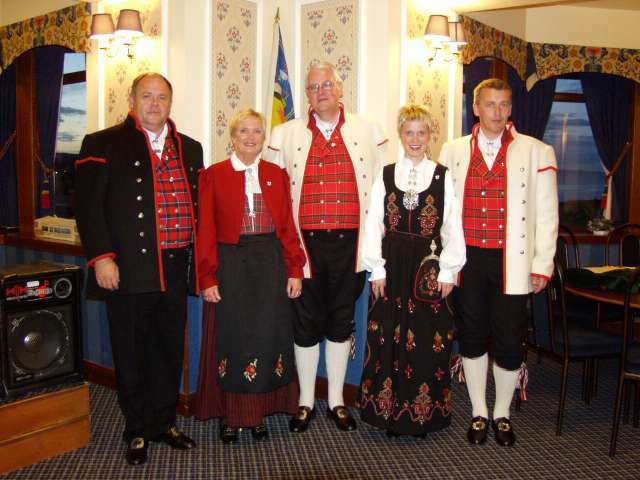 In Gudbrandsdalen today, the local costume “bunad” incorporates a Tartan that is reminiscent of the Red Sinclair. 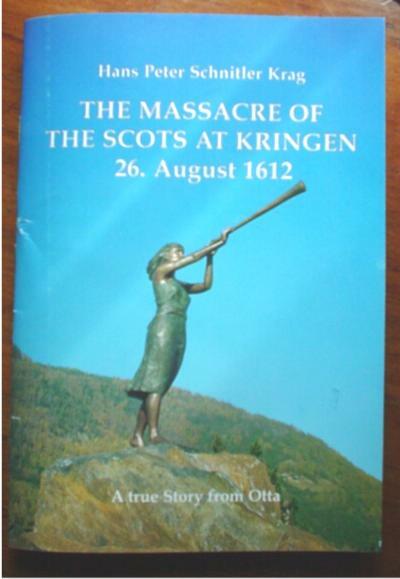 ¤ p 185 of same Historical Document, 2nd Official Report to the Danish Chancellor: "We have also since ascertained that those Scots who were defeated and captured on their march through this country have absolutely neither burned, murdered, nor destroyed on their march through this country, either in Romsdalen or Gudbrandsdalen" Only the theft of a box of valuables from one man was reported. 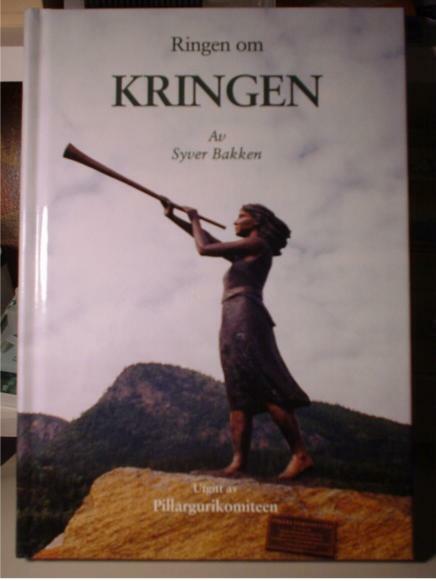 Syver Bakken’s book “Ringen om Kringen”, published 1999, in Norwegian, is the best recent authority on the Battle and its origins and aftermath. It is only now available in local libraries. 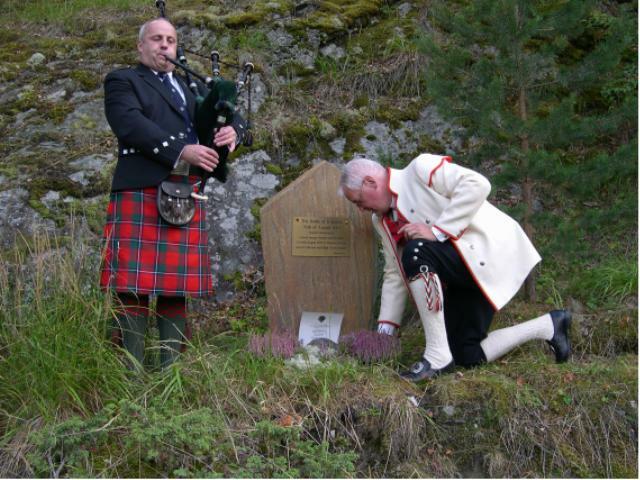 "In the spirit of peaceful co-existence and cultural exchange, and international friendship especially between Scotland and Norway"
Oddveig Rösegg Memorial Lecture: Dr Sally Garden "From Firth to Fjord - tracing Scotland's Music on Scandinavian Shores"
We first went to Otta in 1999. The Silver Badge on the left, representing the horseman riding backwards at Kringen, was kindly awarded to me by the Pillarguri Committee in 2000 when I became a Member of Sinclair's Club. This page and the attached review of Per Holst's edition of Pastor Krag's Account were originally posted on the Sinclair's Club website, which I had created and maintained, as the history page. The website went offline in 2005 when www.ecosse.net ceased the service. Archived pages can still be seen on the Internet WaybackMachine. 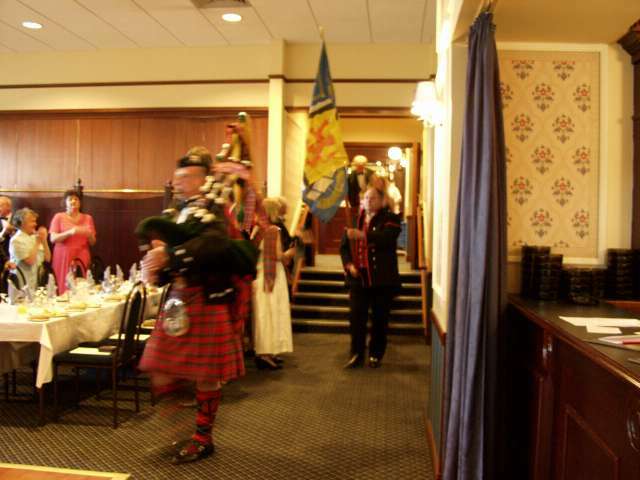 The late Pillarguri Committee and Sinclair's Club Member, Hans Kristian Børud, Eldbjørg Larsen, fellow Committee and Club Member, Inge Leif Larsen, Rakel Dyrhaug and Ragnar Moe; Hans Kristian carrying the Chief's Banner at the Clan Sinclair Gathering, Caithness 2002; Chris Maile and Inge Leif at the New Kringen Memorial in 2004, all originally on the Sinclair's Club Website.